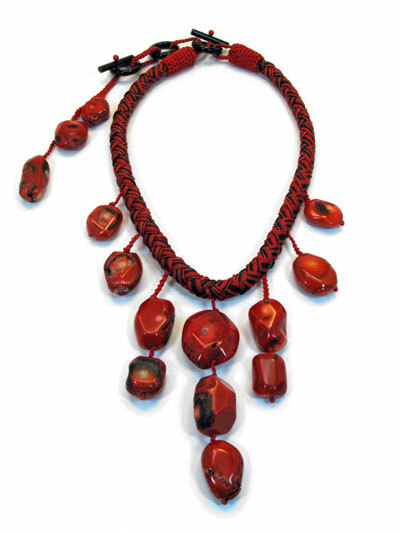 These kumihimo neckpieces have an interesting story. I had made an earlier version with knotted Chinese button for the clasps. It limited the size of the cord to one size. The series got a re-design with a special order - read the blog entry. The 'Red Coral' was also made possible by an experimental red color given to me by a color consultant working for the upholstery and notions industry. She gave me a box of mylon #18 with a spool of an experimental color in a true red. We had met a number of years ago though a thread producer who marketed nylon #18 made especially for the hobby and jewelry industry in particular. I had met him at one of my shows and designed some kits for him, and through him met his color consultant. 17 to 19 inch neck size.